Nebadon Izumi (Michael Emory Cerquoni) has created an animation of code commits to the OpenSimulator project for the OpenSimulator Community Conference 2015. It is produced from the OpenSim Git commit repository using Gource. The YouTube video of the commits in the period ahead of the 2015 conference can be seen at https://www.youtube.com/watch?v=RmgdBaCcvt8. 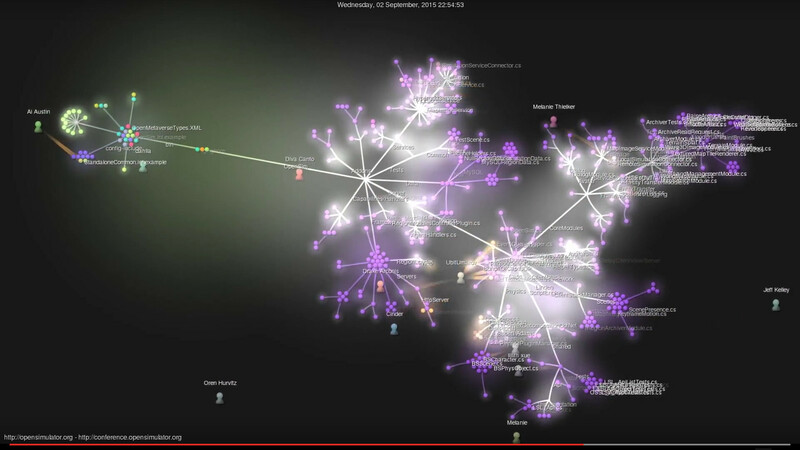 The equivalent visualisation for the commits ahead of the 2014 conference is at https://www.youtube.com/watch?v=bpnWHbs4EWg. The first six years of OpenSim development prior to that is visualised at https://www.youtube.com/watch?v=Mx0BiTh8NEs. Ai Austin’s commits flash by, and in the 2015 visualisation briefly appears around 02:00 and are related to correcting and tidying up the configurations for Standalone OpenSim deployments. This entry was posted in OpenVCE, Virtual World and tagged OpenSim, OSCC, OSCC15, Virtual World. Bookmark the permalink.